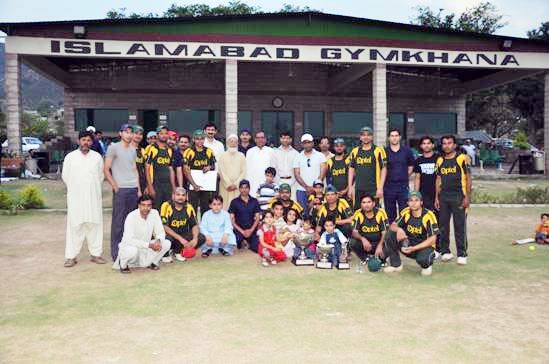 The 1st PTCL corporate cricket challenge 2010 concluded successfully with PTCL Greens as winner. The event was organized by PTCL procurement department. Among participants include the teams of PTCL Greens, PTCL Blues, National Engineers, IMEX International, Getronics, Huawei, Cisco and Inboc Technologies. The final was held between PTCL Greens and IMEX International, in which after a nail biting match, PTCL Greens won the title by 8 runs. Asfaq Q Ahmed was named man of the match as a result of his tremendous performance. Mr. Mohammad Nehmatullah Toor CFO PTCL was the chief guest at the occasion. Who while congratulating the winning team also appreciated the organizers efforts and encouraged them to organize such healthy activities in future as well. He further added “We hope that the spirit of game is kept alive always and cricket continues to grow. All the teams that have participated in the tournament are winners in true sense. This tournament has brought forth many cricketing talents and PTCL’s initiatives like these have been continuously making great contributions in the field of sports”.